Hard gummed Baby, slimed in drool, falls deceivingly swiftly to sleep. 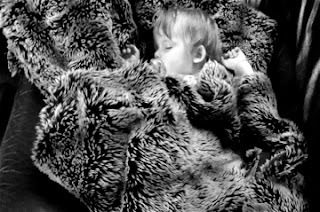 The heat or the teeth or an unknown third option turns the night into a series of walks connecting bed and cot. As birdsong trebles through an open window, Baby is wedged into bed between grandparents. As the sun rises, she sits up, claps hands, slaps Mr Grandad on the shoulder. Rain falls heavy, it’s still hot, the birds call. Downstairs the clock reads 5.55am. Baby rubs a piece of jammy toast over her hair. I reach for a mug the size of a god’s forearm. My sense of scale is half asleep. But it is a big mug. It is filled with a quagmire of coffee. At this hour, caffeine is best served with cartoons. Mostly dabbed clean of blackcurrant, Baby bobs about the room, delighted by two dogs, a drawer of toy cars, a spoon and a brick. 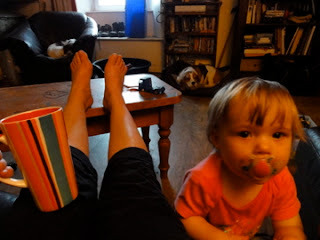 She miscalculates clearance height under the coffee table; refuses comfort; demands comfort; slouches slowly to sleep. Granma slow motion slouches too, after correctly guessing the Scooby Doo villain. Most of whom I came across because of other recommendations, prompted by sociable schemes like the Kreativ Blogger Award, so I hope my sleep deprived cheat isn’t construed as any kind of disapproval. My only mitigating plea is the length of time this has been lurking for me to pass on, and the rather busy week in the midst of it all. Doubly-well deserved, anyway. 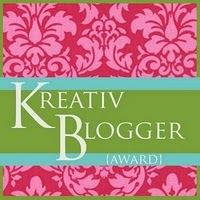 Glad to see you twice recognized with "Kreativ Blogger". Excellence should be rewarded. And thank you for recommending Trainride Of The Enigmas on your blog.